Interested in pursuing a career in the sciences? Consider the many options open to you with a bachelor’s degree in chemistry from George Fox University. Our graduates are chemists, medical students, pharmacists, teachers, dental students and more. 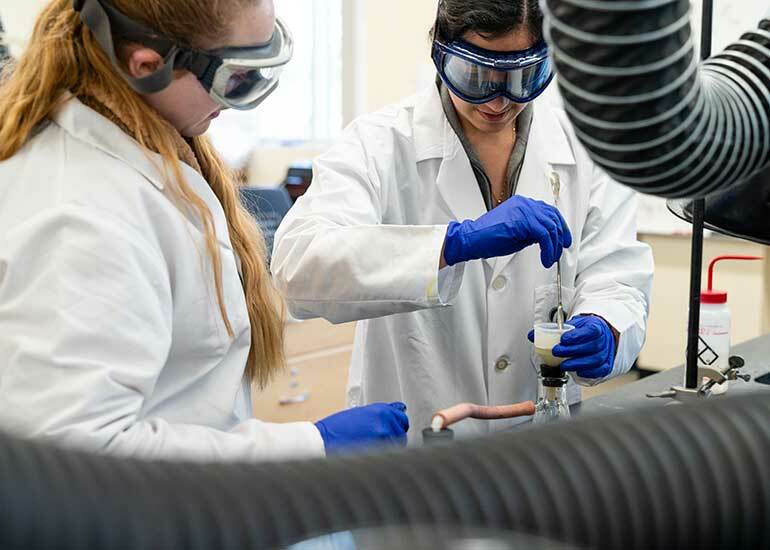 Chemistry majors are prepared to enter the fields of education, research, forensic science and medicine, while many go on to graduate school to further their studies. You’ll take a wide range of courses that cover the theory and practice of modern chemistry, while a number of elective courses allow you to customize your course schedule to meet your unique educational and career goals. You will also study in a Christian college environment that recognizes God as Creator. The quality of our program is reflected by the track record of our graduates, many of whom have achieved success at some of the nation’s top graduate and professional schools and in the job market. Request more information about the chemistry major at George Fox University or schedule a visit to begin your education at Oregon's Christian university, ranked as one of the top Christian colleges in the nation by Forbes. The job outlook for chemists is expected to hold relatively steady in the coming years, with prospects often dependent on the level of education achieved. The best job opportunities in the next few years will likely go to students who complete an advanced degree (MD, MS or PhD). Pharmaceutical and biotechnical firms will continue to be a primary source of chemistry jobs. However, there are many other options, such as education, environmental chemistry and medicine. Oregon Health & Science University, Portland, Ore.
Pacific Northwest National Lab, Kirkland, Wash. 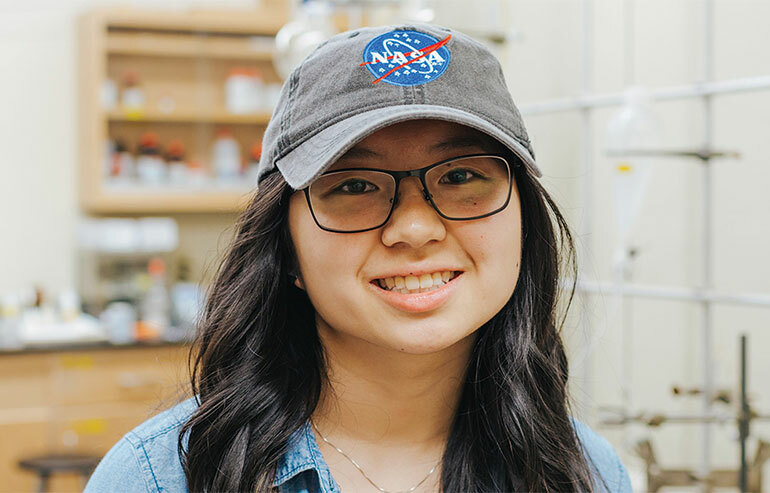 While she doesn’t plan on taking a trip to space anytime soon, George Fox junior chemistry major Asteria Yiu is conducting research that got the attention of the Oregon NASA Space Grant Consortium, which awarded her a $5,000 scholarship for the 2017-18 school year. "The Department of Chemistry provided a safe and supportive environment for me to explore my options in careers in science and medicine, both while I was a student at George Fox and after I had graduated. The faculty took the time to get to know me, and challenge and encourage me in exactly the ways that I needed in order to be successful." "I am grateful for the excellent preparation the George Fox chemistry department gave me for graduate studies. Small class sizes with knowledgeable faculty, summer research projects and TA opportunities were all available to me – opportunities which gave me an edge coming into graduate school." Obtain hands-on experience with state-of-the-art chemical instrumentation. Perform cutting-edge research with professors and present your findings at national conferences. Participate in a research-based senior capstone laboratory course. Learn to think critically and solve real-world problems. Be mentored by caring and knowledgeable faculty who are actively involved in chemistry. Choose from a variety of internship and research opportunities.